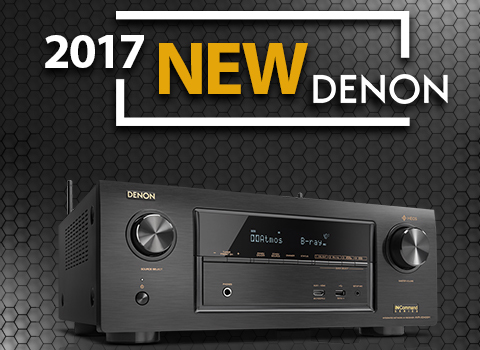 Denon, one of the world’s leading manufacturers of high-quality home entertainment products, builds on the appeal of its Network AV Receiver range with the introduction of a fully-loaded fifth generation model, the Denon AVR-X3400H, one of the most advanced receivers available today. The Denon AVR-X3400H is a 7.2-channel design, with fully discrete amplifier technology allowing it to deliver 105W from each of its seven channels for powerful, precise and detailed sound from music and movies alike. 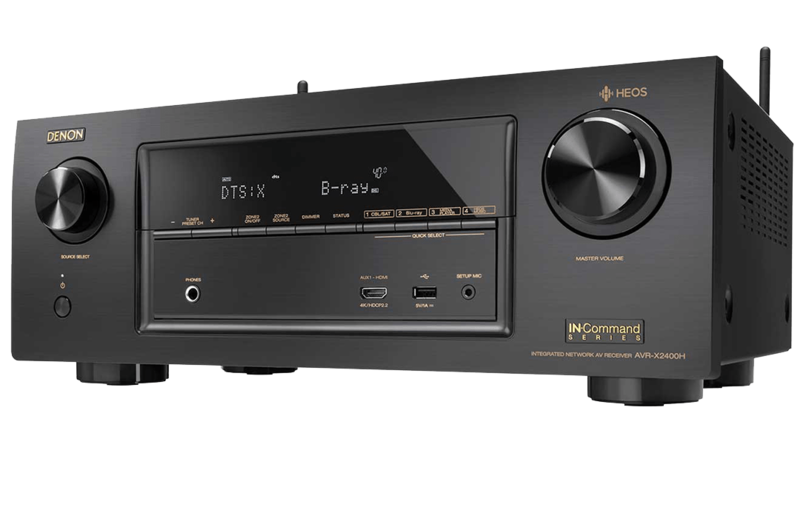 The new receiver supports the latest audio and video formats, including Dolby Atmos and DTS:X, 4K Ultra HD with HDR (High Dynamic Range) and Dolby Vision for futuristic viewing and listening. In addition, the AVR-X3400H features HEOS multi-room wireless music streaming, allowing it to combine with other HEOS products to create a comprehensive home entertainment system, all under app control. For ultimate setup control, the Denon AVR-X3400H features high-precision Audyssey MultEQ XT32 setup and optimization, enabling users to measure and elevate the home theater environment to promote optimal speaker placement and sound quality. It is also compatible with the Audyssey MultEQ Editor app, allowing the user even more control of the sound set-up than ever before. In addition to the introduction of the AVR-X3400H, Denon is announcing that its HEOS-enabled AVRs, including the recently launched Denon AVR-X1400H and AVR-X2400H, will support Amazon Alexa’s latest Smart Home Skill for Entertainment Devices. This new Alexa skill enables voice commands to control a range of functions on Denon AVRs natively, including volume control, transport control, mute, next track and external input switching. The Alexa Smart Home Skill for Entertainment Devices firmware update will be made available for HEOS-enabled Denon AVRs in September 2017. As well as wireless Bluetooth, the AVR-X3400H has full network connectivity via Ethernet or Wi-Fi. Twin antennae and dual-band support guarantee a strong network signal even in crowded Wi-Fi environments, and once connected, the AVR-X3400H opens up unlimited music sources and playback options. These include Apple AirPlay, streaming from network attached storage devices (NAS), Internet Radio and a wide range of streaming services including Pandora, Spotify, Amazon Prime Music, iHeartRadio, SiriusXM, SoundCloud, Tidal, Napster or Deezer (availability differs by area, subscription may be required). High-resolution audio files including FLAC, ALAC or DSD (even up to 5.6MHz) are also supported and played back in impeccable quality. The new Denon AVR-X2400H offers all the winning features of its predecessor the AVR-X2300H, but with greater ability for both home theater and music use. It includes the ultra-precise Audyssey MultEQ XT calibration and set-up system, complete with Denon’s new Audyssey MultEQ Editor app (available for purchase in the Appstores) to allow the user to fine-tune its settings. And it can be used with the HEOS system, thanks to HEOS integration. The Denon AVR-X2400H is a 7.2-channel design, with fully discrete amplifier technology that brings high power as it deliver 95 watts per channel at 8 ohms, 20 Hz~20 kHz, 0.08% THD from each of its seven channels, and a powerful, precise and detailed sound from music and movies alike. It has built-in decoding for both Dolby Atmos and DTS:X, creating immersive three-dimension cinema experiences. Being a Denon product, the AVR-X2400H is built to play music to a very high standard. With its wireless Bluetooth, it seamlessly plays music direct from portable devices, and has full network connectivity via Ethernet or Wi-Fi. Dual antenna and dual-band support guarantee a strong network signal even in crowded Wi-Fi environments, and once connected, the Denon AVR-X2400H opens up unlimited music sources and playback options, including Apple AirPlay, network attached storage devices (NAS),TuneIn Internet Radio and a wide range of streaming services including Pandora​, Spotify​, Amazon Prime Music, iHeart Radio, Sirius XM, Sound Cloud, Tidal, Napster or Deezer (*), (where available; subscriptions may be required). 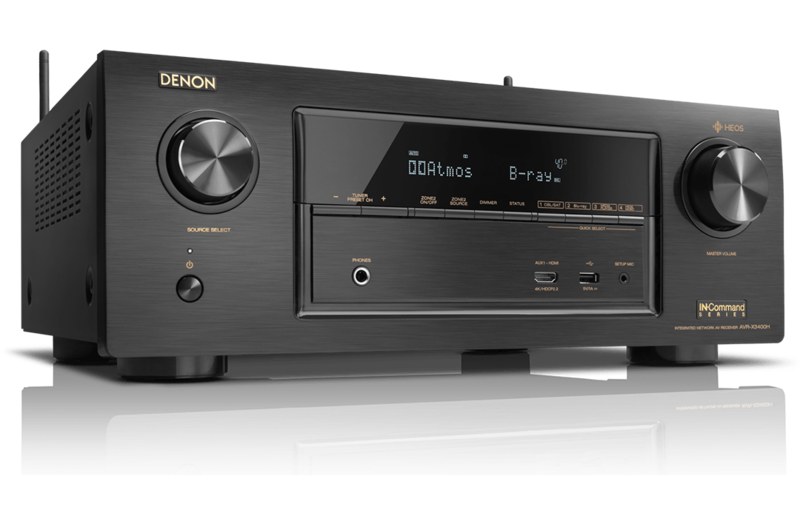 The Denon AVR-X2400H is simple to set up and use with Denon’s exclusive Setup Assistant. It features clear on-screen graphics and text that quickly and easily guide users through the setup process, optimizing critical system settings for the best possible sound quality. Four Quick Select function buttons let the user choose their favorite input sources, and remember preferred audio settings for each source to deliver precisely tailored sound. Lastly, Denon’s advanced ECO Mode enables the Denon AVR-X2400H to tailor its power consumption to the way it’s being used, reducing energy use by as much as 50% when playing at low levels. The user can switch the ECO Mode on, turn it off for full-power use at high levels, or set it to Auto and allow the Denon AVR-X2400H to make the decisions based on the content being played and volume levels. An on-screen Eco meter can be displayed to monitor the amount of energy the receiver is using.